IMASCO has worked to produce high-quality products coupled with a dedication to service for over 50 years. To meet the needs of those in the building and manufacturing industries, IMASCO continually challenges itself to develop new products that are more effective and efficient. Choose cement stucco and you are choosing a natural product. 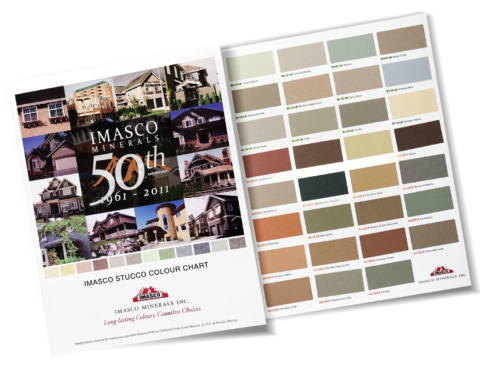 Our colour chips will help clients choose the perfect stucco colour. Please find our texture brochures for all IMASCO finishes in the resources section of our website. Please note that we will be closed from Monday, December 24th, 2018 to Friday, January 4th, 2019. Imasco Minerals is pleased to welcome four new dealer locations for our stucco and EIFS products. IMASCO’s modern manufacturing plant is situated in Surrey, British Columbia. From this location, we serve Western Canada and the Northwestern United States. Please tick if you are an architect, design consultant, builder or distributor.